Soon after its foundation in 1970, Kairos opted to concentrate on economic ties with South Africa, a choice influenced by the World Council of Churches. When in 1972 the World Council launched an appeal at multinational companies to withdraw from South Africa, Kairos decided to focus on Shell: a large and strategically important company both in the Netherlands and South Africa. Kairos chairman Cor Groenendijk addressed Shell shareholders for the first time in their 1973 annual meeting in The Hague; this was followed by a series of discussions with the management of Shell which dragged on fruitlessly for years. 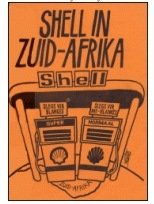 A Kairos-sponsored study on Shell and South Africa was published in 1976, both in Dutch and English (‘Shell in South Africa’). It generated greater interest on an international scale in the role played by the Dutch-British energy giant. Shell was also one of the companies that had continued their activities in white-ruled Rhodesia after Ian Smith had made his Unilateral Declaration of Independence in 1965. Supplies to Rhodesia had been declared illegal, with a mandatory UN oil embargo in force since late 1966, followed in 1968 by a comprehensive trade embargo; all UN member states were bound to implement these mandatory measures in their national legislation. In the early 1970s the Dutch Anti-Apartheid Movement (AABN) was able to reveal that Rhodesian sanctions were being broken from the Netherlands, after AABN activists had laid hands on information from the tobacco trade. Petroleum products kept flowing into Rhodesia, too. In talks with Kairos and with the Dutch Council of Churches Royal Dutch/Shell repeatedly claimed that the parent company had no control over its Rhodesian subsidiary, and neither was the Shell Group involved in any illegal supplies. As it was becoming apparent, however, that Shell had been involved in a crafty scheme to evade the Rhodesian embargo via South Africa all along, there was a growing feeling that it was about time to stop talking and get into action. Shell should withdraw from the apartheid country: thus the motto of the emerging campaign, that was eventually to spread over many countries. As it had become clear even before the illegal activities of Shell were uncovered, more Dutch firms appeared hardly concerned about the UN embargo against Rhodesia. In 1975 a commission presided by State Secretary Kooijmans concluded that it was impossible on the basis of current Dutch legislation to get a grip on firms which, in defiance of mandatory UN sanctions, illegally collaborated with Rhodesia. By setting up the committee the government of the day had signalled its commitment, displayed by none of its predecessors, to seriously implementing the UN embargo in national legislation. Hampered by delaying tactics, a Sanctions Bill drafted by the Kooijmans commission was only passed in parliament under a new government in 1980, 14 years after the imposition of UN sanctions, 6.5 years after the commission had been set up – and just a few weeks before independence turned Rhodesia into Zimbabwe. Posted in: Africa, Business Principles, GoogleNews, Oil, Royal Dutch Shell Plc.